24″ x 60″ painted on Masonite (safe for an outdoor covered porch). Signed Starek in the lower left corner. Buyer pays for shipping. Edgar A. Stareck was born in Benton, Kansas and studied at the University of Kansas at Lawrence. He exhibited at the Kansas Free Fair in 1939 and the Midwestern Artists Exhibition in 1940. Having achieved some level of success in his native Kansas, he relocated to New York City in the mid 1940’s. He studied at the Art Students League in 1948. He traveled in North Africa and Italy, making sketches and watercolors. 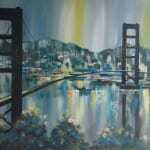 His paintings have appeared in numerous New York City art galleries. He has twice won first place at New York’s Washington Square Outdoor Art Show. On April 7, 1972 one of his paintings served as a first day cover design on a United Nation’s envelope commemorating World Health Day. He was essentially a Greenwich Village artist. His themes vary between Mid-Century Modern with City Scapes, Abstracts and Animals.